Following what Bloomberg calculated was a record net reverse repo liquidity injection on Wednesday, when the PBOC injected a whopping 560 billion yuan of liquidity into the financial system via open market operations, the Chinese central bank has done it again and in Thursday's open market operation, it sold 250BN yuan in 7 Day repos (slightly below yesterday's record 350BN), and 150BN in 28 Day repos, which net of maturities resulted in a whopping net 380BN yuan ($56.2BN) liquidity injection. 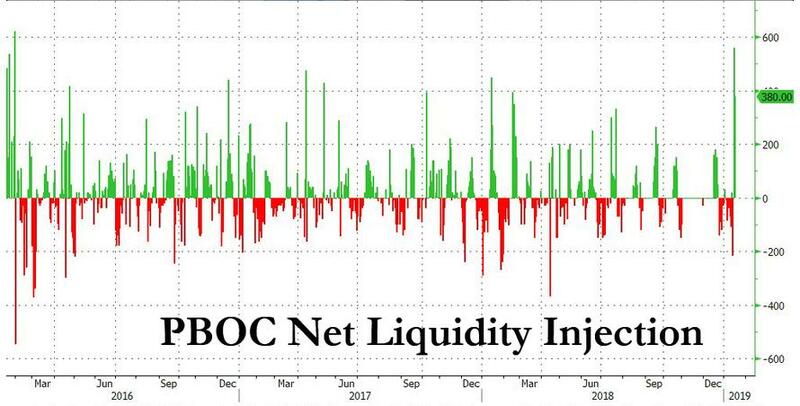 This brings the net liquidity injection this week to a near record 1.14 Trillion yuan (Monday 20BN, Tuesday 180BN, Wednesday 560BN and Thursday 380BN) and the week is not even over yet - should tomorrow's reverse repo be of similar magnitude, then this week will go down in history as China's biggest liquidity injection on record. As yesterday, today's massive liquidity injection was aimed at "keeping reasonable and sufficient liquidity in banking system as liquidity falls relatively fast during peak season for tax payments," according to a statement from the PBOC, although why this year should be such a significant outlier, even when factoring in the liquidity needs ahead of the Lunar new year, to prior periods was not exactly clear. Two days ago in a press conference between the PBoC, the MoF and the NDRC, Beijing announced new tax cuts, fresh measures to stabilize auto consumption and an announcement that authorities are supportive of increasing issuance of local government “special bonds” to stimulate infrastructure spending were all made in a “stimulus” spasm. Overnight Chinese Premier Li has called for more investments in infrastructure and services, while also voicing support for a “stepping-up” of targeted economic controls from authorities. And, as discussed in this post and last night, the annual PBoC liquidity injection to offset the pre-Lunar New Year holiday-/pre-tax payment peak-/maturation of MLF funds- cash drain went full mental" last night, with the Chinese central bank injecting a record 560B Yuan ($84B USD) into the system using 7d reverse repo operations—the largest 1d cash injection in their history, and was followed by a not much smaller 380B Yuan injection today. It is worth noting that this short-term liquidity injection adds to the larger "credit impulse" being re-engineered by Chinese authorities, which on the headline level came in as “better than consensus” estimates across new aggregate social financing & new loans. Unfortunately for Chinese stock bulls, this week's record liquidity injections have had no impact whatsoever on Chinese stocks, which were unchanged yesterday and are flat on Thursday, while S&P futures are fractionally lower, amid growing fears that the trade war storm is back on after the WSJ reported that U.S. authorities are investigating Huawei for stealing trade secrets, while according to a separate report, Apple plans to cut back hiring for some divisions, and finally Singapore exports unexpectedly fell, a trifecta of news hitting the market's three weakest points: trade, earnings and the slowing global economy. The bigger issue is that if not even China can move the needle with short-term liquidity injections, and a long-term monetary intervention is out of the question for now due to China's record debt, while fiscal stimulus takes months if not quarters to kick in, once the sugar rush from the current bear market rally is over, the hangover will be especially brutal.